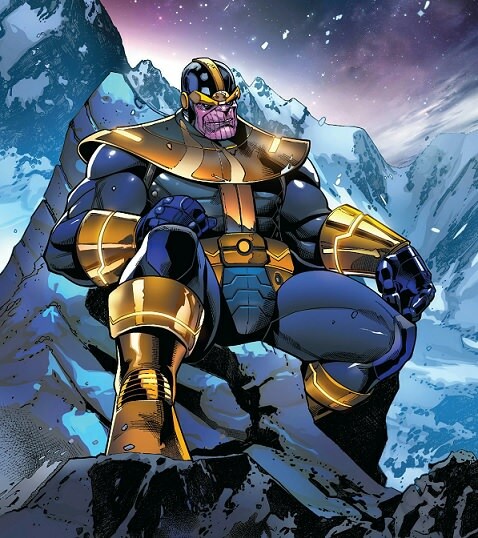 Yesterday we discussed The Best Avengers Villains! 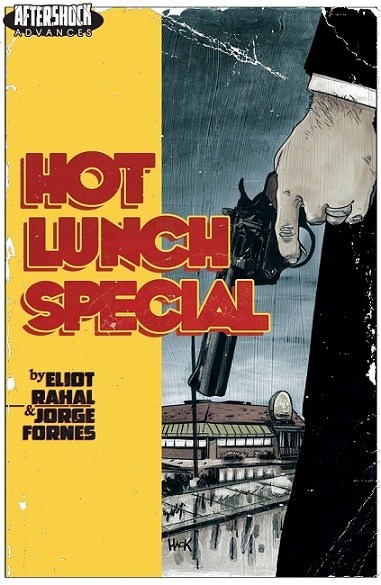 Writer Eliot Rahal spoke about the premise of Hot Lunch Special: “HOT LUNCH SPECIAL is, in its simplest terms, a story about a small-town family with big dreams that gets a little too big for their shoes. They take on more than they can chew, and end up getting into a bloody and merciless war with one of the most feared Irish crime syndicates in America. 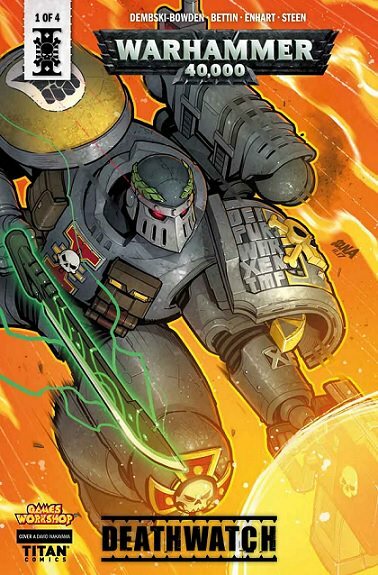 Written by Black Library superstar Aaron Dembski-Bowden! “Farlaine the Goblin has spent years wandering the very many Oddlands of Wug in search of a forest to call his own. 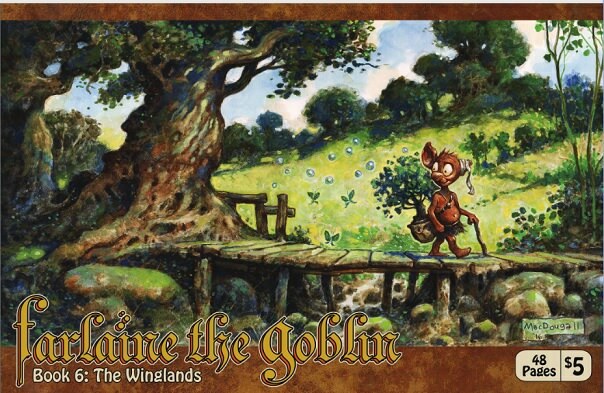 I just had the pleasure of being introduced to the world of Farlaine the Goblin not too long ago and found the books to be dazzling to a degree rarely seen in Independent books. I can honestly say that each and every page is filled with beautiful artwork and a story that will have a smile on your face from beginning to end. I have to say (again and again) that Farlaine encompasses everything that is fun and good about the comic book medium. A mix of genres is masterfully balanced, giving the reader a tale of adventure, humor, and magical delight. Farlaine the Goblin is one of those rare books that everyone should be reading because it offers something for the lighthearted in all of us. I’m at a loss of words on how writer/artist Pug Grumble is able to do it all. You don’t need to know much in order to enjoy this book but I urge you to start at the beginning. You simply won’t find a better value in comic books today. The book follows a small tree Goblin named Farlaine who is searching for a forest to call his own. Along the way he encounters a variety of characters who help, and sometimes hinder, his search. Book 6 finds Farlaine the Goblin traveling to The Winglands, a flying land where everything grows wings! From butterfly wings to fairy wings to grasshopper wings, this is a land full of flapping. The story engages all-ages and the art will make you stop and stare in its detail and clean form. Each page is layered with wonder that’s meant to be discovered and appreciated. A true delight to the eye. Again, I cannot do this book a disservice by comparing to anything else on the stands because it easily stands out on its own. This book perfect to introduce kids to what comic books offer or for the seasoned reader who needs a reminder of how fun comic books can be. Grab this on Amazon and tell your friends, Farlaine the Goblin truly deserves a larger audience. And cross your fingers that Mr. Grumble continues to write and draw for many years! Warning: this story contains graphic violence and mature language. Murder #1 is not for the faint of heart but when you look at the subject matter and the message, it’s a book people need to read. A thrilling mix of sci-fi and drama, Murder throws us into a world where domesticated animals are linking together physically, one species at a time. 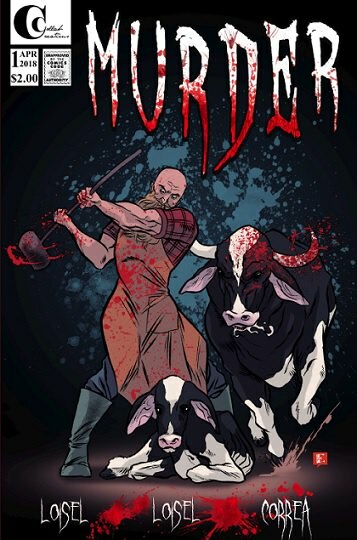 We also meet The Butcher’s Butcher, who stands out as a truly striking character. The Butcher’s Butcher is the only human on earth who can hear the thoughts of theses animals and communicate back telepathically with them. The book revolves around the bond between humans and non-human animals and how their lives touch daily. Rodeos, dairies, hatcheries and farm animal sanctuaries, this book will make you look at the minute details of the mundane world of service animals in a new light. World building, especially in Independent comics, can be a tricky thing and usually writers attempt to do too much, forgetting to anchor the reader with a memorable character. Co-authors Matthew and Brittany Loisel take the challenge and set up the reader for a thoughtful, gripping journey. The first issue does exactly what it’s supposed to do. Set the stage and give us an idea of where things might be going. You’ll find yourself in the minds of dogs, cats, chicken, and cows. While you might hesitate, I can assure you this book delivers in its presentation. Artist Emiliano Correa takes the story and presents a clean, easy to navigate style, which is a must when it comes to an unknown project. The mood of the story is clearly read through the art and compliments both quiet and action scenes. Issue #1 of Murder is expected to be released early-Summer 2018 so keep your eyes peeled. Even if you’re not the biggest animal lover, it’s message resonates long after you put it down. Ghost Rider and Captain Marvel and you have unparalleled power. Will it be enough to stand up to a Celestial killer? 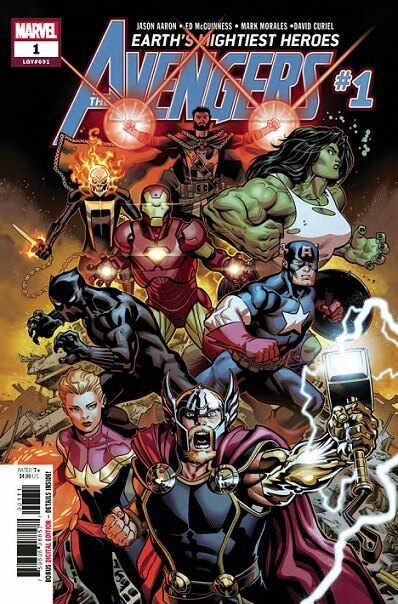 Jason Aaron and Ed McGuinness are no strangers to epic storylines and this one is shaping up to be one of the classics. The story begins with a little taste of what we saw in Marvel Legacy #1. I for one want much, much more of the 1st Avengers. We then move to the present, where Stark, Odinson and Rogers are contemplating the need for an Avengers team, whether they should reunite. Before they can decide they are interrupted by a galactic event, so large they will need their collective firepower to handle it. Will it be enough? This is an event of titanic proportions, so you need a writer with experience in these types of stories, so Jason Aaron is a great choice. It jumps back and forth from the past and the present, as have many of Aaron’s stories, and it works here. It helps that the art team of Ed McGuinness and Mark Morales bring their ‘A’ game as well. With the movie fresh in the public consciousness the spotlight is on the Avengers. This comic is a great jumping on point for new readers with enough nostalgia for us old school fans. I highly recommend this issue. 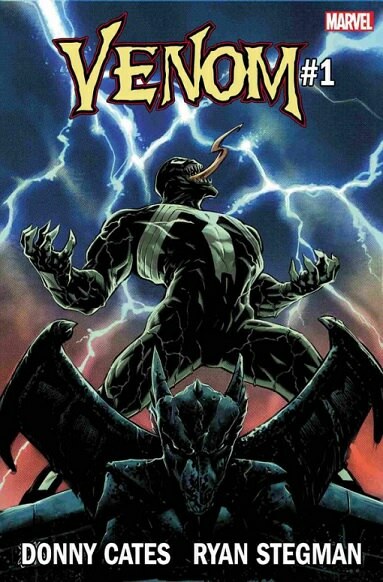 Not too long ago I reviewed Venomized it rated it a shaky 7.5 out of 10. It felt overloaded and was a bit too much so I picked up Venom #1 with a hesitant feeling. Writer Donny Cates and artist Ryan Stegman.kick off the first issue in stellar fashion and keep things focused and moving. This is one of those instances that I can recommend this for both old fans and newcomers drawn to learn more after watching the Venom movie trailer. For a character that’s been around for 30 years, spun-off from Spider-Man, and over-saturated back in the 90s, Venom #1 felt fresh. The art over-delivers on every page and you’ll find yourself going back to take it all in. The book sets the right tone and the art his the darker mood of the character. Eddie Brock is battling poverty and finding it difficult to control his erratic symbiote self. A hearty thumbs up and another one to add to the pull list.